The Chinese edition of Chasing the Modern, titled 志在摩登:我的祖父徐志摩, was just published by CITIC, and crowds throughout China expressed their love of Xu Zhimo by turning out in astonishing numbers to meet author Tony Hsu. Standing-room-only audiences thronged bookstores in Beijing, Shanghai, Jiaxing, and Hangzhou with hundreds of copies selling out each night. Xu Zhimo fans were clearly excited to read a fresh account of the poet's life, written by his grandson. Here's a glimpse into Tony Hsu's recent mainland book tour. Copies of Chasing the Modern, with its vibrant orange and blue cover that was designed for the Chinese edition, were displayed prominently. 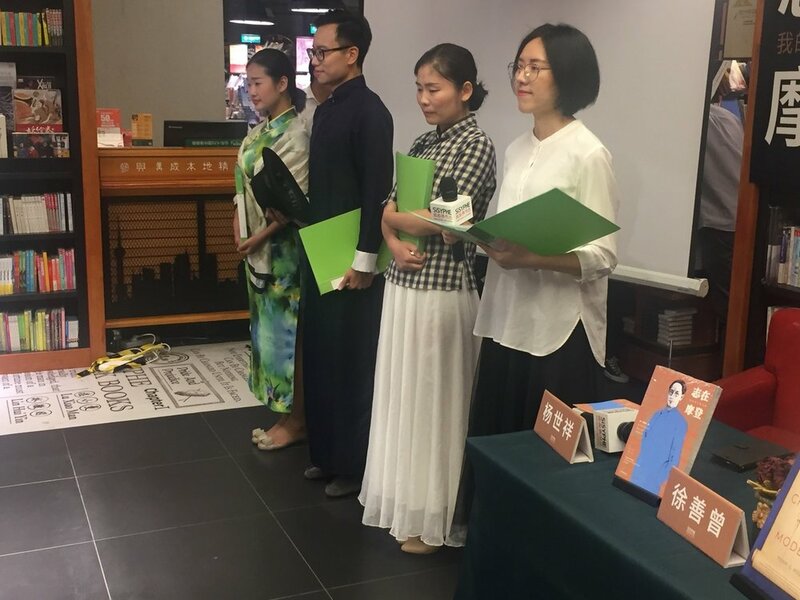 At Sisyphe Bookstore in Shanghai, members of "The Voice" reading club espoused the roles of Xu Zhimo (played by Jason Zhang), Zhang Youyi (Katia Deng), Lin Huiyin (Jessica Qiao), and Lu Xiaoman (Vivian Cao), reciting imagined confessions from each figure. Min Zhao played the Chinese zither to accompany the performance. Audience members hold up their copies of Chasing the Modern along with Tony Hsu at Sisyphe Bookstore in Hangzhou, China.